If being chained to a desk sounds soul-crushing to you, and you’d like to make a career of your good hand-eye coordination and enjoyment of physical activities, then consider becoming a forklift operator with a forklift certification. Operating a forklift is challenging and rewarding physical work that provides you with the satisfaction of a job well done when you clock out each day. What Makes Forklift Operation a Great Career? Forklifts are material handling equipment that are used all throughout the world in many different settings. From retail warehouses, to material manufacturing plants, to construction sites, forklifts are in demand in multiple industries. When you choose to become a forklift operator, you have your choice when it comes to cities to live in, industries to work in, and the types of positions you can qualify for. You can enjoy a decent income as well. The median national salary is $33,722. You can enjoy a nice quality of life and a portable skillset when you become a forklift operator and complete forklift certification. Furthermore, as a forklift operator, you can have the option between being an employee or being a contractor. You can enjoy the stability of work as an employee for a business or company. Or, you can be a contracted employee which means you go where the work is, and you work for a number of companies. As a forklift operator, you can enjoy the freedom to create the lifestyle you want. Find work with local businesses, or apply for a job at a top company like Harley Davidson or Coca Cola. If you enjoy working outside near the water, you can find work as a dock worker driving a forklift truck while loading and unloading ships in the marine sector. If you prefer to work indoors, warehouses are one of the biggest sources of job opportunities for forklift operators. Warehouse work may involve anything from working with high-end retail, shifting cartons of toilet paper around, or placing delicate and valuable computer equipment. And if you’d like to work alongside your favorite beer, breweries are often looking for forklifts. Additionally, you can work for special events helping to carry, lift, and transport set props, lighting, stage and music equipment. The options are endless! When you become a forklift operator and take the initiative to get a forklift license, you will be able to find work wherever you want—in your hometown, or in a city you’ve always wanted to live. Exciting places like Las Vegas and Los Angeles are constantly hiring forklift operators for help with show and special event set-up. That could be you! Why exactly is forklift certification so important, you ask? Well, the industry has one of the worst track records for industrial accidents. Every year, roughly 100 forklift operators lose their lives and another 20,000 are seriously injured. The main causes – forklift overturns, pedestrian struck by forklift, victim crushed by forklift and victim crushed by forklift – are all easily preventable with the right training. The Office of Safety and Health Administration (OSHA), requires forklift operators to receive the necessary training to prevent more of these unfortunate accidents. Forklift certification provides proof to prospective employers and OSHA that you have been trained to comply with OSHA standards. You can protect your life, keep OSHA happy, and help your employer avoid costly fines by having a forklift certification. Enjoy a long, successful career that is free of accidents! Now, your next question may be, “where can I find OSHA-compliant forklift training so I can get my forklift certification to launch my career?” Lucky for you, you’re in the right place! Choose CertifyMe.net and Become a Forklift Operator in One Day! 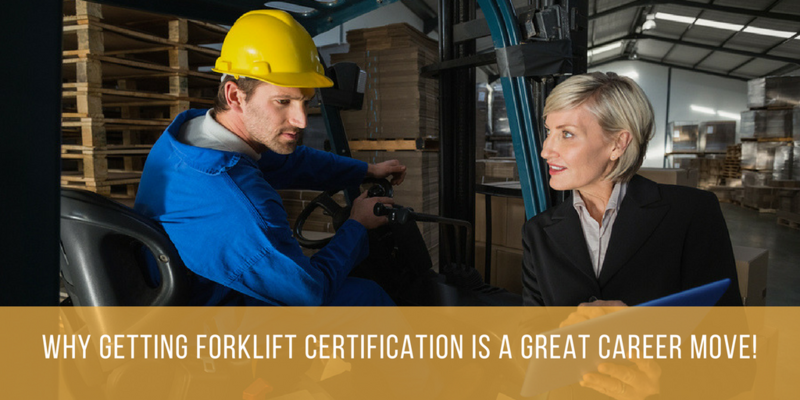 Whether you are looking for your first job or pondering a career change, there are a lot of advantages to getting forklift certification. The money is good, you can basically choose wherever you want to live and work. If you’re ready to get into a few job as a forklift operator, fast, CertifyMe.net offers the most convenient, quick, and affordable forklift training available! We teach aspiring operators everything they need to know to operate forklifts safely, from mastering the controls to performing daily inspections to recognizing and avoiding hazards. OSHA-required three-year renewals are always free, and you’ll be completely OSHA-compliant. Alternatively, you can purchase all three of these modules with our Bundle Package and receive a discounted price. Complete the online modules in only about one hour from any device with an internet connection, and print your certificate instantly after completion! In one afternoon, you can be trained and qualified to work as a forklift operator! Sign up today to receive your forklift certification!